Grow plants at an easy working height in this unique patio garden. 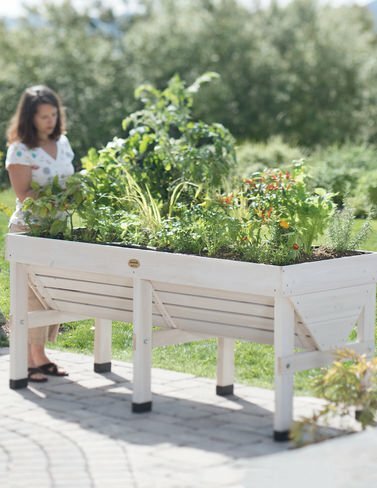 The V-shape makes efficient use of space and planting mix — grow deep-rooted plants like tomatoes in the center, shallow-rooted crops like salad greens along the edges. Plants are out of reach of animal pests, too. Includes a fitted fabric liner to keep soil contained while letting excess water drain. Plastic feet protect wood from wet surfaces. Quality construction and easy assembly. If you have any questions about this product by Vegtrug Limited, contact us by completing and submitting the form below. If you are looking for a specif part number, please include it with your message.